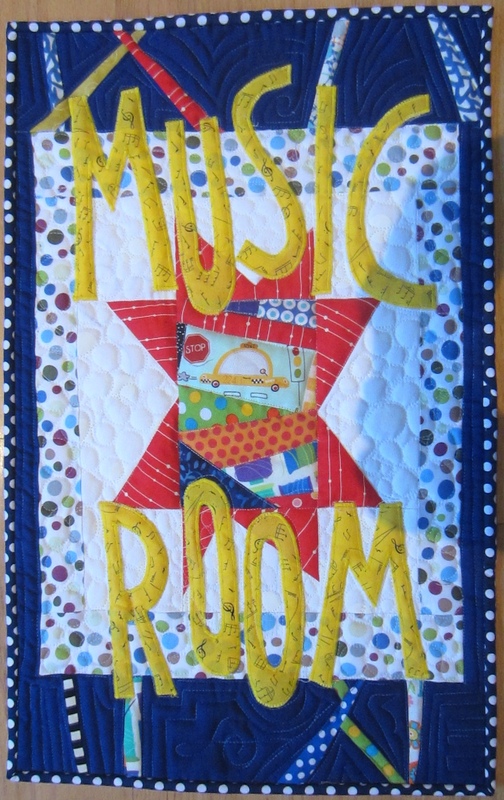 This entry was posted in Quilt Blocks and tagged elementary music, free motion quilting, music, Orff specialist, original quilt design, quilted wallhanging, red star, red yellow blue quilt, retirement, teaching music by pamelajeannestudio. Bookmark the permalink. congratulations on your new job, it sounds really awesome! your little quilt to greet your students is so happy. I saw music note in the quilting. I made my daughter quilt wall hanging for her classroom. The students do enjoy the warm welcome. Wishing you the best in the coming year. Thanks, Georgia. This will be a big life change for me, and I don’t feel quite prepared yet. But hopefully I will get a lot done in the next few weeks. Congratulations! I’m so very happy for you. By the way, I have your last month’s triangle/squares. Thanks, Kathy. Will you be at the Bee on Friday? I will try to come. Congratulations Pam! Love this quilt, and I am sure your new students are going to love learning from your experience and expertise! Best wishes! Too bad I’m not teaching quilting, ha, ha! Thanks for your support, Shelia. Love this, Pam. So, have you already moved? Not quite. Actually, I’m leaving my hubby here to deal with the house. So I’ll just take off with my suitcase (and lots of books and instruments) in about 3 weeks. Actually it’s kind of appropriate. In September, it will be 37 years ago since I moved here with 2 suitcases–straight from my honeymoon. So this is a BIG change for me. I haven’t had time to think about the life I’m leaving behind. But I believe it is for the best so I can be there for my mom. Welcome to Las Vegas, Pamela! My town too. Thanks, Sharon. I really enjoy your art. Maybe we could meet up some time. That would be great, you can email me at smann45333@aol.com, I’ll give you my phone #.